Lara Noel Hill is known for her vintage designs, that begin with pieces from the past that she picks up at flea markets, estate sales and antique shows. She then re-designs these pieces and turns them into beautiful and timeless jewelry. Many celebrities wear her jewelry, from Hilary Duff to Avril Lavigne, from Sharon Osbourne to Pamela Anderson! She also works with you, the client, to bring an old family heirloom back to life, and turning it into a custom designed piece of jewelry. Now, inspired by the Victorian era, and after many requests from her clients, Lara Noel Hill has created a vintage inspired replica collection, to fit everyone's budget. And this is your chance to win one of her designs: the Creme Topaz Cluster! 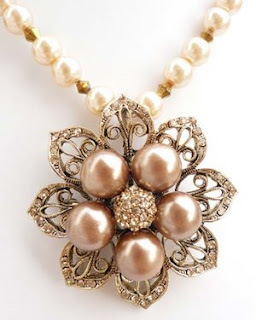 This beautiful creme glass pearls necklace paired with creme pearls and topaz rhinestone brooch! What a great Mother's Day present this would be! To enter the giveaway, simply visit Lara Noel Hill website, and then come back here to let me know which piece, other than the Creme Topaz Cluster, you would love to own. The giveaway ends on Monday, April 27th at midnight EST, and I will pick a random winner on Tuesday, April 28th. Sorry, open to US residents only. That is beautiful! I like the window of perception one. I think it is timeless and would be able to be worn with so many things. I would love to own the purple pearl bracelet. All her designs are stunning, it was hard to choose! I think the "Lara" line of jewelry are lovely. I am not entering the contest as much as I would like to. I enjoy my Amelia Rose necklace very much. It functions as a talisman for me. This Lara Noel is not too hard on the pockbook so those who do not win can still find something nice. Good luck all. OMG I would love to own the Yellow Bouquet or Magnolia Snow. The bouquet is so cute and feminine and the magnolia snow is so classy and elegant! I like the Rose Patch necklace although I gotta tell you, that was no easy task. The acrylic Princess bracelet was a favorite as well. What fun it must be to come across a vintage or costume piece and know just what to do with it! I think this jewelry is elegant, unique and very wearable. Actually, after looking through the website, I really am drawn to the Burgundy & Pale Pink flower bouquet necklace you included in your email. I think that's my favorite piece! But my mom would love the Creme Topaz, so I'll enter the contest for that. Thank you! The Pastel Point of View bracelet is gorgeous!!! It was so hard to just pick one!! I love the creme brulee necklace with the leaf. It's very classic and timeless. I love the vintage look of the "Delicacy" bracelet. The whole line is lovely! The "Charmed For Life" bracelet caught my eye and I'm sure my mom would adore the Cream Topaz cluster! Truthfully, it's a very hard choice as I haven't seen jewelry quite as beautiful as this in years. Reminds me of my grandmother's jewelry box that I used to play in when she'd let me play dress-up. I think the Magnolia Snow is my favorite. That's a great idea! 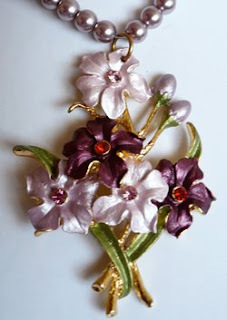 I like the purple choker and the Burgundy & Pale Pink flower bouquet you have posted here. Thanks for the contest! Magnolia Snow is so amazing!! thanks for the giveaway!! The Charcoal Black Wreath is wonderful statement piece. The "Hot House Flowers" necklace, defintiely! I adore the Large Sunburst! It's stunning!